The camp of former President Goodluck Jonathan has called Vice President, Yemi Osinbajo, a Pastor that tell lies. This is in reaction to Osinbajo’s claim that Jonathan doled out the sum of N100 billion and $295 million in cash two weeks to the 2015 elections. 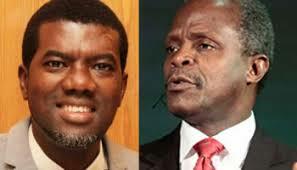 A statement by Jonathan’s former special assistant on New Media, Reno Omokri said Osinbajo lied to divert attention from the ongoing saga involving former Pension boss, Abdulrasheed Maina. “My attention has been drawn to claims in the media by the Vice President, Professor Yemi Osinbajo, against former President Jonathan. Speaking on Friday the 27th of October 2017 in Lagos at a ‘Greater Nigeria Pastors Conference’, the Vice President said: “Weeks before the 2015 elections, the government then, gave out N100billion in cash and $295million in cash ostensibly for security within two weeks”. “I make bold to say that the Vice President has once again taken to his characteristic habit of lying. “Nigerians may recall that only last week, Vice President Osinbajo was in Anambra state where he lied that the present administration had paid $2 billion for the second Niger Bridge. “I had cause to expose that lie and forced the Presidency to issue a ‘clarification’. The money released was 2 billion Naira and it came from the Sovereign Wealth Fund set up by the Jonathan administration which the APC resisted and challenged in court. “It will also be recalled that in February 2016, the Vice President again lied when he claimed that both the Jonathan and Yar’adua government did not build a single road. This fact was easily disproved when even members of this administration, including Osinbajo’s boss, President Buhari, began commissioning projects, including roads built by the Jonathan administration. “Nigerians will recall that the Jonathan administration rebuilt the Benin-Ore portions of the Benin-Lagos road, the Vom-Manchok road, the Kano-Zaria Road bridge (named after late Emir Ado Bayero) and many more. “On this recent allegation by the Vice President, not only has the Vice President again lied, he is doing so to divert attention from the Maina scandal in which the administration in which he serves, by the testimony of the Maina Family, invited Abdulrasheed Maina, the infamous alleged pension thief, back into the country, reinstated him, promoted him and deployed him as Director of Human Resources in the ministry of Internal affairs. “When they were found out, the Presidency resorted to its favorite past time of blame game by preposterously accusing former President Jonathan of somehow magically being the brain behind Maina’s return. This is even as the Attorney General of the Federation, Abubakar Malami, had already revealed that he “acted in the public’s interest” in initiating the process for Maina’s return. “There is also the $25 billion Nigerian National Petroleum Corporation scam which is the biggest scam ever in the history of Nigeria since 1914 to date. “Finally, Nigerians want to know the truth about the Babachir Lawal probe which has been concluded and handed over to the President many months ago but of which no action has been taken. “Nigerians want to hear the truth about these scandals and not tired lies about looted funds that keep being recycled without proof. “It is not too late for the Vice President to turn a new leaf and begin to apologize to Nigerians for the three million jobs a year he and his boss promised, but ended up losing 4.5 million jobs in their first two years according to the Nigerian Bureau of statistics. “If Vice President Osinbajo is looking for who to blame for the present sorry state of the Nigerian economy, he should buy a mirror.